To set better freelancing goals, focus on what you can control. In other words, don’t focus on how many new clients you want this month – focus on how many pitches you’ll be sending every day. And to stay better motivated with your income goals, focus on how much billable work you’re doing each day (after breaking down your monthly goal into a daily goal, of course). 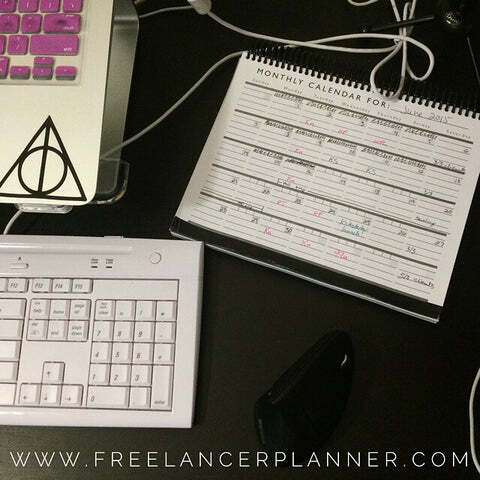 Have you checked out the Freelancer Planner Kickstarter yet? We’re over halfway funded! You can back for as little as $1, and you can reserve your planner for $25. There are discounts for buying two or more planners, so you can even go in with a friend or knock out your holiday shopping early! (I know you have at least one productivity nerd or organizationally challenged creative on your shopping list.) If you want to help by spreading the word, you can click here to tweet about it, repin this pin, or share this post (or this image) on Facebook. Thanks in advance – you rock.